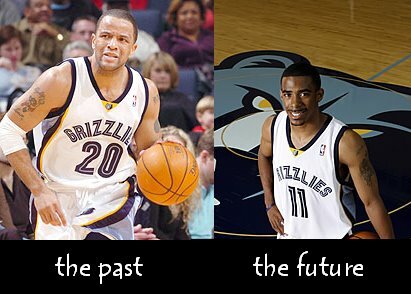 In December of ’07, Damon Stoudamire was still the starting PG for the Memphis Grizzlies. He still ran the team and even embraced his new role as mentor of 20 year-old rookie PG Michael Conley, who was out with an injured right shoulder. But the time came when Conley’s rehab was complete and he was due back in action. When Conley finally returned on December 30, the Grizzlies promptly inactivated the struggling Stoudamire and inserted Conley into the starting lineup. As one might expect, Stoudamire (a 12-year NBA vet) didn’t take this well and has since repeatedly asked to be traded. What does this mean for Mike Conley Jr? A solidified role in the starting lineup, ample playing time and an opportunity to run a high-powered Memphis offense. In his last 5 games, Conley has shown his versatility as a fantasy player–able to not only pass and shoot, but rebound and steal at an above-average rate. These numbers are not spectacular, but anyone with some foresight can see the potential in Conley and his fantasy stats. Here are the main reason’s why Conley will have success the rest of the season. The Memphis Grizzlies may not be the best team in the league (in fact they are one of the worst), but they can certainly push the ball up and down the court and score–something fantasy managers love. They aspire to be like the Golden State Warriors or the Phoenix Suns in how they play. Conley has only played eleven games thus far. With some time to adjust to the pace of the NBA, Conley will mature and his numbers will increase. He’s in the starting lineup and knows that this is his team to run. If it were appropriate, I’d almost start calling him Conney-Franchise, after Stevie-Franchise of the Houston Rockets. Being endowed with the opportunity to run a basketball team is a blessing, and Conley will most likely take advantage of it. If Mike Conley Jr is still available in one of your leagues, I would seriously consider picking him up. He will be a legitimate point guard option the rest of the season. I, myself, was able to find him in 1 out of my 3 leagues. Get more articles like this by subscribing to The Trading Block’s RSS Feed.